Ruffie arrived in Ohio after an incredible adventure with Hengelaar in Holland. It was pretty late when he got done telling fishing stories but I did manage a little time to talk about Huron, Ohio and the surrounding area. As you can see Ruffie was losing patience and the pier bite just wasn't happening. I explained we would change the focus and spend more time at my most beloved water, the Sandusky River. A few short days later and we found ourselves on the river shoreline. Ruffie was quite the skeptic as I explained the tactics for the day. We are allowed to fish with two poles per person and I would be bottom fishing with nightcrawlers on one pole and the other would be doughballs. While Ruffie understood completely about using the nightcrawlers, he was very intrigued by my simple dough offering. "Ruffie, it's just a piece of bread with a little corn that you knead in your hand until it turns into dough. Don't forget to take the crust off!" "Well done Ruffie, that's a perfect doughball!... hmmm those black specks shouldn't be on them... Ruffie, you weren't in the nightcrawlers were you?!" "It's not huge but it's a start"
"Ruffie, grab the pole with the nightcrawler on it... look it's a Freshwater Drum"
Well this trip was going much better then all of our previous trips combined. Ruffie was having a blast. I was hoping that eventually one of our Common Carp would be of a bigger class and sure enough, we got one! "Ruffie, isn't that a dandy specimen?!" After we got that fish Ruffie became a bit more impressed with the Sandusky River and began asking many more questions about it. He was particularly interested in wanting to see more species and I let him know I would try my hardest to put him on more fish. Mid conversation we had a nice bite on our nightcrawler rigged pole. It felt like a decent carp but we were in for a rough fishing treat! "Whoa! Ruffie, it's a Smallmouth Buffalo!" What a fun day. We not only managed to start catching fish, but had a couple notable catches thrown in. We didn't know it at the time, but this would also be our only trip for awhile. Sadly, I would learn that my position was pretty much being eliminated at work. No time for fishing, it was serious business looking for a new job. So while I spent my time job hunting, Ruffie showed support by watching WFN all day and drinking all my beer and eating all my snacks. Ruffie says, "pfff, Doug Stange, you call that a Wels?, talk to my boy Gijs, our bait was that big"
I was doing everything I could to find employment and decided a midweek fishing trip was needed. After all, I was depressed and Ruffie was becoming an alcoholic. The sad duo really needed to pull it together. Our destination would be a rather skinny bit of water that I have caught some good Steelhead and resident Rainbows out of. Angling pressure was decent for a Wednesday, I'm assuming the mild temps are keeping more folks on the water I explained. Ruffie was a true sportsman and when another angler wanted to fish with us, he obliged. As luck would have it, that angler hooked into a nice bright chrome 7 pound Steelhead! Ruffie and I manned the net for him and expertly landed it. Ruffie was impressed with the jumps and way the fish peeled line. Ruffie was polite and didn't request a picture with the fish but did get a great look at it. After the catch, the other angler decided to leave on that bit of success. Ruffie and I continued fishing... drifting jigs/maggots, spawn sacs, minnows, casting spinners, spoons. We stayed at it many hours before we noticed something cool... a darker fish pushing a small school of minnows. It wasn't a Steelhead, wrong shape and color. All I could think is 'match the hatch', so I tied on a swimbait about the same size, color, and shape of the minnows getting moved around by the bigger fish. After several times of spotting the fish and casting near it, I finally got a wrist jolting strike! I had guessed the fish was a Smallmouth Bass but as I played it towards the net, I could see it was a big stream Brown Trout! In fact only the second Brown I had ever caught at this location and a new PR for the species! "It's a beautiful big stream Brown Trout Ruffie!, look at that Kype!" To top the day off, as we loaded the car to leave... I had a voicemail. It was a message from a company I had done two interviews with the previous week for a Marketing Director position I really desired. I had a formal offer of employment! Ruffie and I decided to head back to the Sandusky River a few more times with the same strategy we used on our first successful day there. One pole with a doughball and one with a nightcrawler. 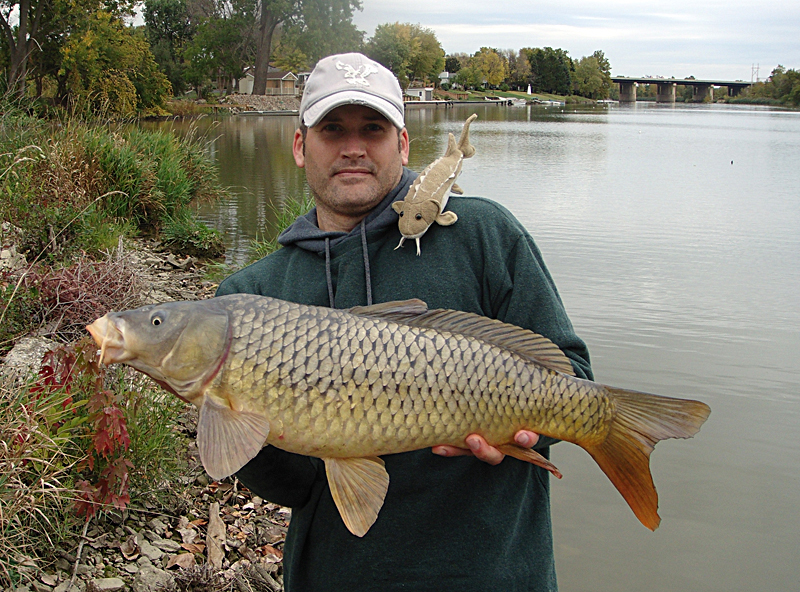 Each trip we caught more fish, but none of the carp rivaled the size of the largest from that first day. We also didn't encounter another Buffalo of either type. Our nightcrawler rigged pole did yield a few other species. "Ruffie, that's a decent Channel Catfish"
I had felt pretty good about Ruffie's Ohio adventure and it was exciting how the Sandusky River came through for us with fine catches. This is the river of my youth that I feel a near religious connection to. I explained to Ruffie that I wanted to do a final trip to the river, but not to fish. This would be more for educational purposes. Having seen the catches from the Sandusky River firsthand, Ruffie was more then willing to learn more about the river. "where we are fishing is about 6 miles from Sandusky Bay which connects to Lake Erie. Only a hundred years ago Lake Sturgeon just like you came up this river to spawn, following a path set by their ancestors"
"In 1912 the Ballville Dam was constructed to provide a municipal water supply for the town of Fremont, Ohio"
"while this dam was useful and a necessity for the people at the time, they understood very little about the vast environmental effects of the dam. Sadly, this same situation played out all over the Great Lakes with the damming of tributaries that were the historical spawning sites for Lake Sturgeon. Can you believe that commercial harvest in Lake Michigan in 1879 was 3.8 million pounds and in 1929 it was a mere 2000 pounds!? Let's head over to the Ballville Dam. "because of this dam, fish biologists talk about the spawning habitat for species like yourself and Walleye in terms of square feet rather than in miles. In fact, if the dam gets removed, fish would gain around 25 miles of additional habitat! More then 20 miles from here in Seneca County at an archaelogical dig site they have found Lake Sturgeon bones... indicating they did travel that far at one time"
"the ODNR has offered the city 5 million dollars to help build an upground reservoir and the project is currently underway. To remove the dam will cost $400,000 and so far about $90,000 has been raised. I can only hope the funds are secured and this river can be returned to it's native flow..."
It wasn't a sad ending to his Ohio trip, rather one that we reflected on the promises and hope of tomorrow. I let him know the trending towards dam removal and that I would continue to be an advocate on the Ballville Dam removal! I thanked Ruffie for his interest and let him know that maybe people reading about his adventures would come across the story of the Sandusky River and become more informed on dam removals and habitat issues. I think Ruffie had an excellent Ohio adventure and I know he's excited at the prospects of what his next adventure might bring!